Prominent, sharp lines give this 60-inch double vanity an elegant look that will be the envy of friends, relatives and your contractor. Natural birch and veneer wood grains burst from a tobacco finish on this classic-style cabinet to evoke a sense of warmth and harmony. Beyond four inset doors lies a spacious interior where an abundance of bathroom accessories can be stored above or below four fixed shelves. Additionally, three middle drawers offer more storage space for powder room essentials. Complement this vanity with tobacco-finished wall mirrors or a linen tower from the Avanity Madison collection to give your bathroom a rejuvenated vibe. Classical in style, the Thompson Collection boasts a timeless appeal that will enhance the beauty of any bathroom. Tasteful detailing enriches the sophisticated aesthetic that includes the choice of either a Charcoal Glaze or French White finish. A solid wood frame, dovetail construction and Black Bronze hardware speak to the quality craftsmanship of this collection. The Thompson 24-inch vanity features ample storage and can be matched with one of our natural stone tops to create a functional and fashionable centrepiece to your bathroom. Classical in style, the Thompson Collection boasts a timeless appeal that will enhance the beauty of any bathroom. Tasteful detailing enriches the sophisticated aesthetic that includes the choice of either a Charcoal Glaze or French White finish. A solid wood frame, dovetail construction and Black Bronze hardware speak to the quality craftsmanship of this collection. The Thompson 36-inch vanity features ample storage and can be matched with one of our natural stone tops to create a functional and fashionable centrepiece to your bathroom. 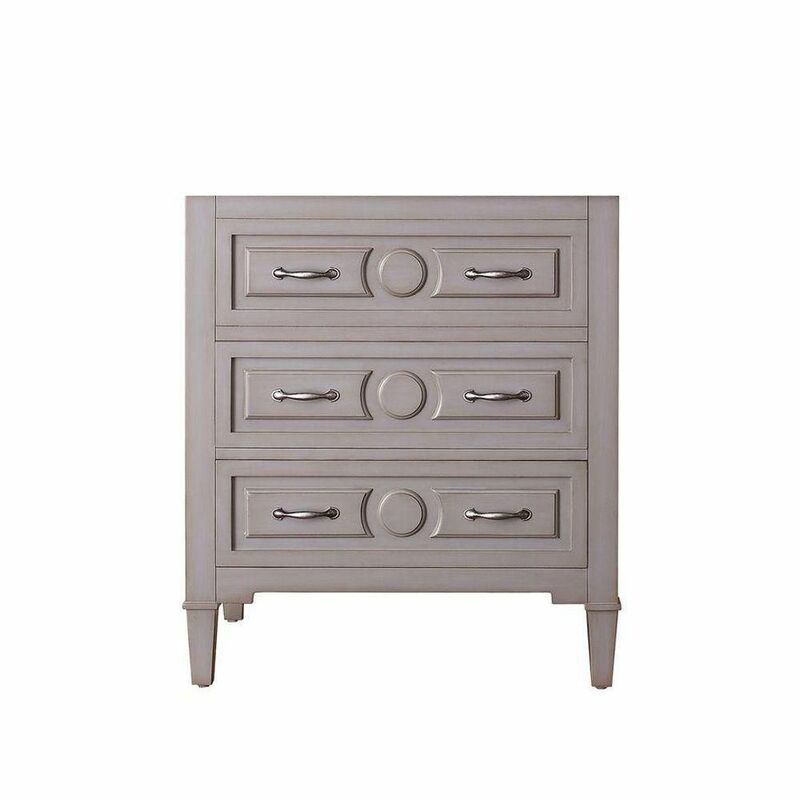 Kelly 30-Inch Vanity Cabinet in Greyish Blue A contemporary Grayish Blue finish accents the elegant detailing and solid poplar construction of the Kelly 30-inch vanity. Kelly's furniture grade styling and generous storage space can be paired with the matching Linen Tower, providing ample practicality and panache to your bathroom space. Add a handsome and sturdy stone top to complete your vanity set.